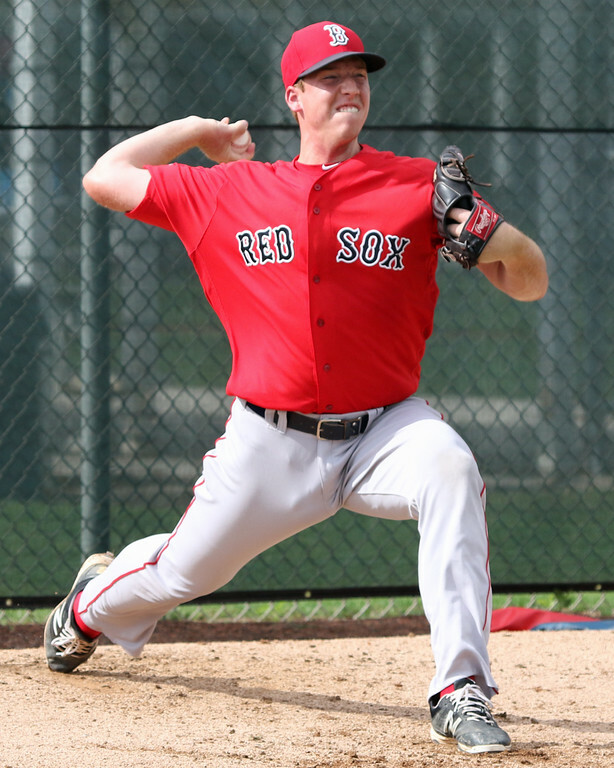 Outfielder Andrew Benintendi and right-handed pitcher Teddy Stankiewicz (pictured) are the Player and Pitcher of the Month for April, as voted on by the SoxProspects.com community. After taking home SoxProspects.com Offensive Player of the Year honors in 2015, Benintendi has improved in his first full season as a pro. He is the logical choice for Player of the Month after an April in which he hit .360/.426/.640 with 22 RBI in 22 games for High-A Salem. The second-ranked prospect led the Carolina League with 17 extra-base hits, and his six triples were tied for tops in the minors. He closed the month in style, belting two game-winning hits and driving in 11 runs during a three-game stretch from April 27-29. Perhaps the most impressive stat is how infrequently Benintendi swung and missed. Salem broadcaster Kevin Burke noted that from April 16-27, Benintendi went 10 games and 48 swings without a swing-and-miss. That efficiency helped him strike out a Carolina League-low six times. Stankiewicz, who has undergone some delivery changes since he was selected in the second round of the 2013 draft, seems to be on an upward trend this season with Double-A Portland. Stankiewicz sported a 1.13 ERA, 18/4 strikeout-to-walk ratio, and a minuscule 0.79 WHIP in April, earning him Pitcher of the Month honors. The 22-year-old was excellent in his four starts, tossing six innings and allowing one earned run or less in each. Even though he dominated, Stankiewicz didn't register a victory in the opening month. Consistency has been a strength for the 16th-ranked prospect, who has thrown over 140 innings in each of his two full seasons.